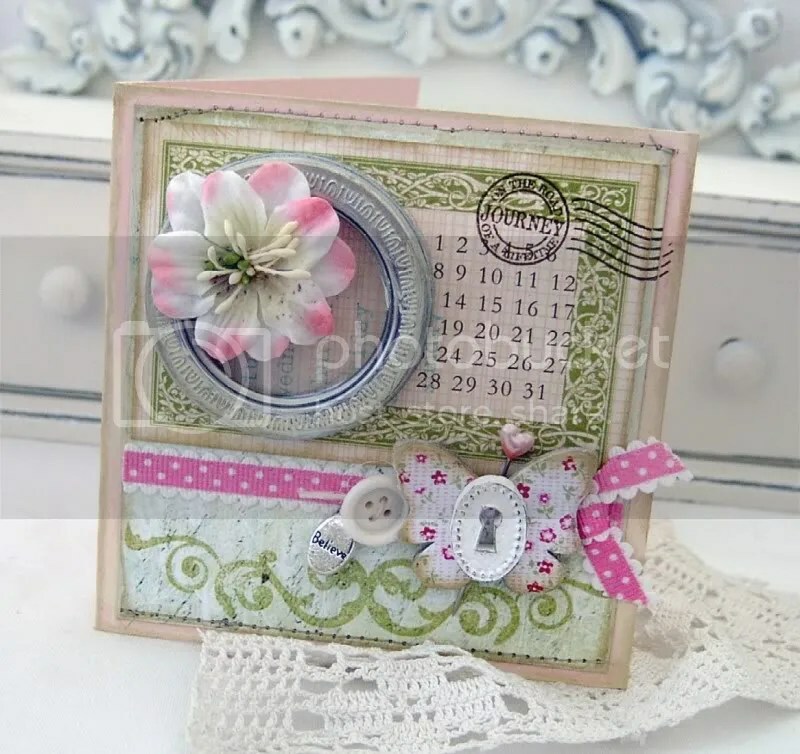 Their blog is loaded with card inspiration so head on over and see what’s new! Question of the Day: What to you to calm yourself when you are a bundle of nerves? Digital Download, Scrapbooker's Club House News! Don’t forget about our pattern paper sale! Tomorrow is the last day! Visit our store here. Hi ladies! 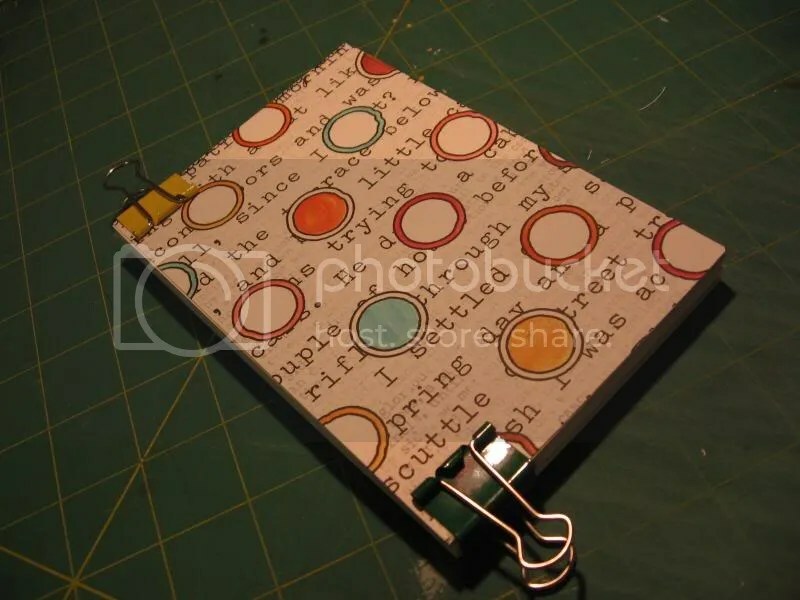 Today I am going to show you how to make a little notebook! 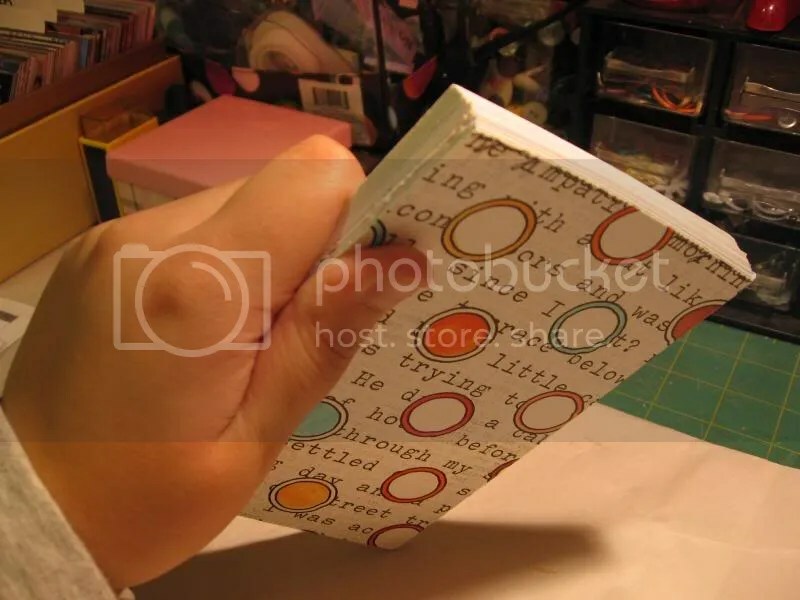 I originally saw this idea done using photos to make a notebook, which would also work just fine, but I don’t really like having sticky fingers or marks touching my photos, so I thought that I could make this using scrapbook materials! This is a time consuming project, but the results are cute. I hope you enjoy it! Step 2: Cut your stack of paper into the size you want your notebook to be. I decided to use some of my old scrap paper for my pages. Some are just parts of a page and others are whole sheets of 12×12 paper that I wasn’t going to use in my albums anymore but that I couldn’t bear to throw away. The important thing to note here is that the thinner the paper the better. 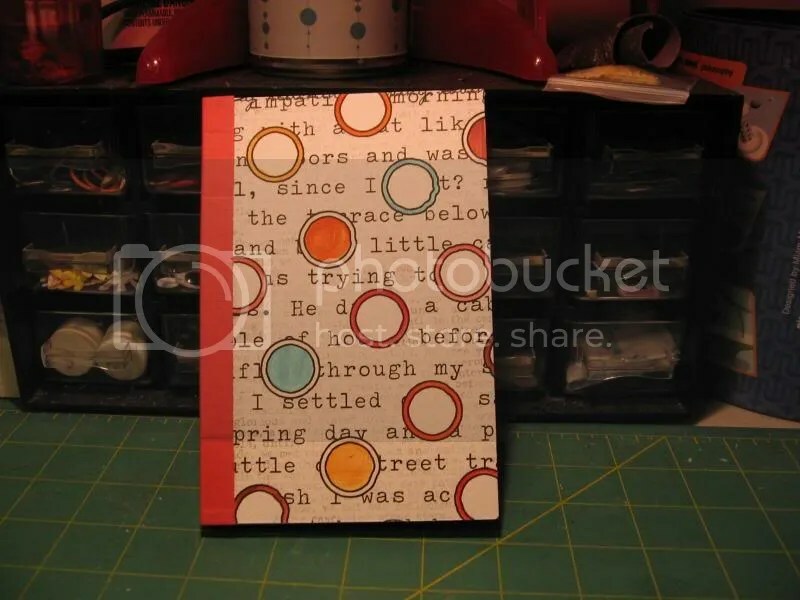 I decided to try scrapbook paper, but you could use notebook paper, scrap printer paper, newsprint, etc. You want to have between 50 and 75 papers for your notebook. The thinner your notebook the better the glue will hold it together. Mine was around 75 sheets. I decided to cut my pages at 4×6 inches. Step 3: Holding your stack of papers run through them like you would a deck of cards to loosen the sheets up. I decided to shuffle mine to mix up the patterns. The important thing here is that you don’t want your sheets to be sticking together because you want them all the be covered with glue later on. 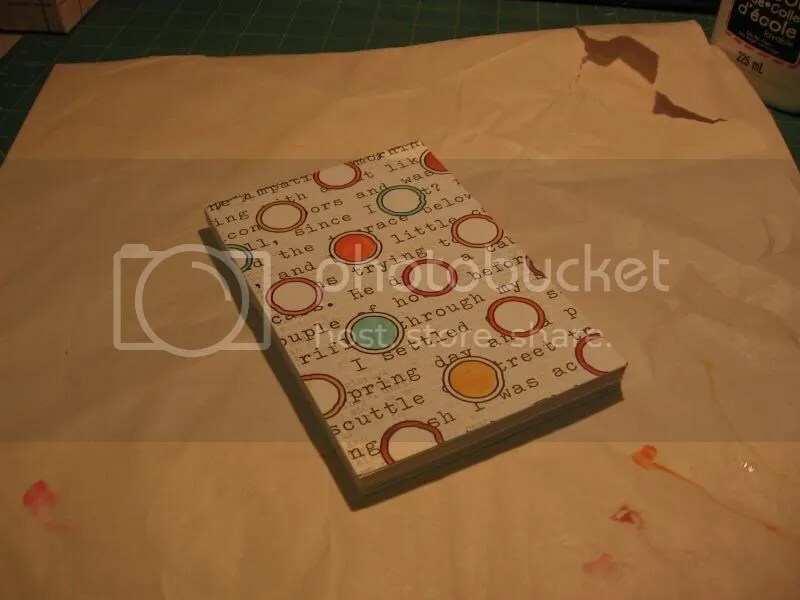 Step 4: You should also have two 4×6 (or whatever size your notebook will be) pieces of patterned paper, cardstock, photos, etc, whatever you want to use for the cover, cut. Your cover should be sturdy so the thicker the cover material the better. I decided to use some cardstock thickness patterned paper. Add these pieces to your stack of paper to form the cover. Step 5: This step is crucial if you want your book to stay together. Tap your pile of papers against your work surface on the side that will be the spine of your book, and on one end. You want to have all your pages lined up as evenly as possible because this is where you will be gluing. 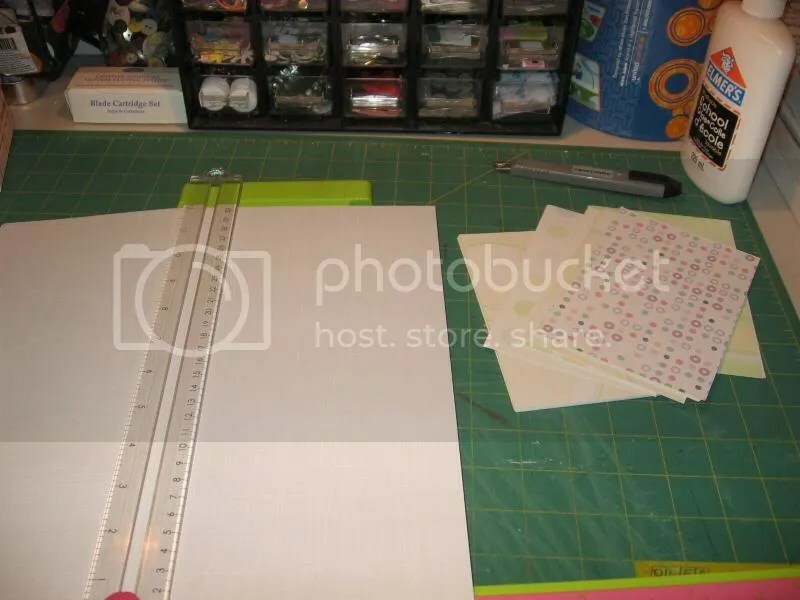 Once you have your pages lined up, with the spine side of your pages on the work surface, slide your binder clips onto the stack, one on either end. With the binder clips on either end your notebook should look something like this, depending on your orientation. 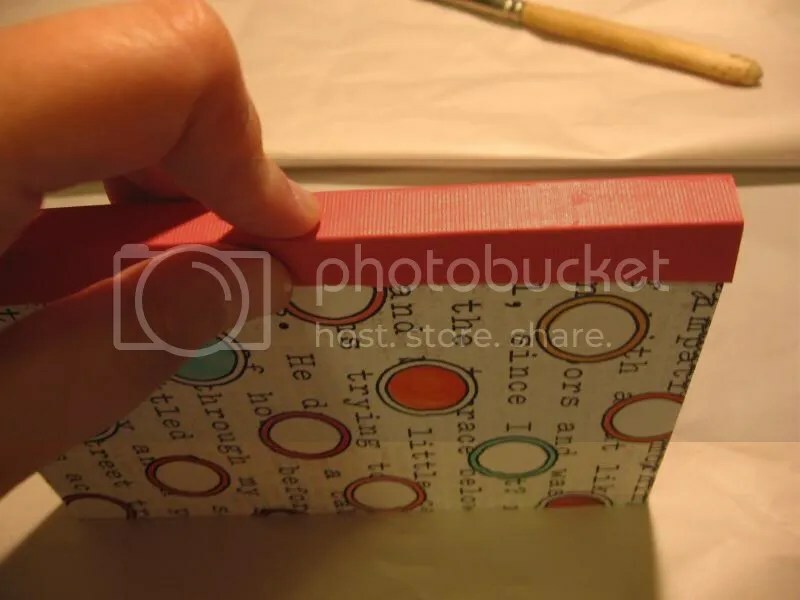 Step 6: Apply a thin layer of glue to the spine side of your notebook, and use a paintbrush to spread it around, being sure to cover the entire spine. Don’t worry if the glue runs over the edge – that will be covered up later. 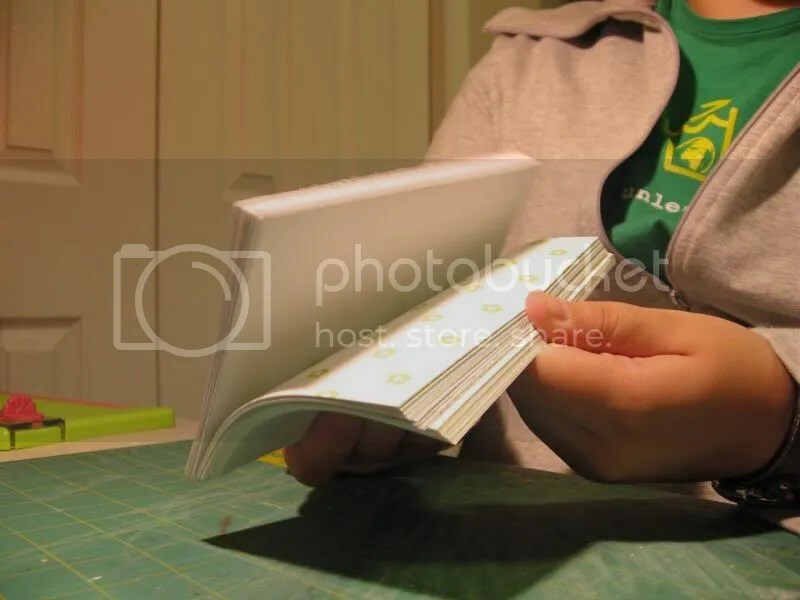 If your pages start to expand a bit, just use your fingers to squeeze the spine area back together. Step 7: Add another layer of glue and use your paintbrush to spread it around. 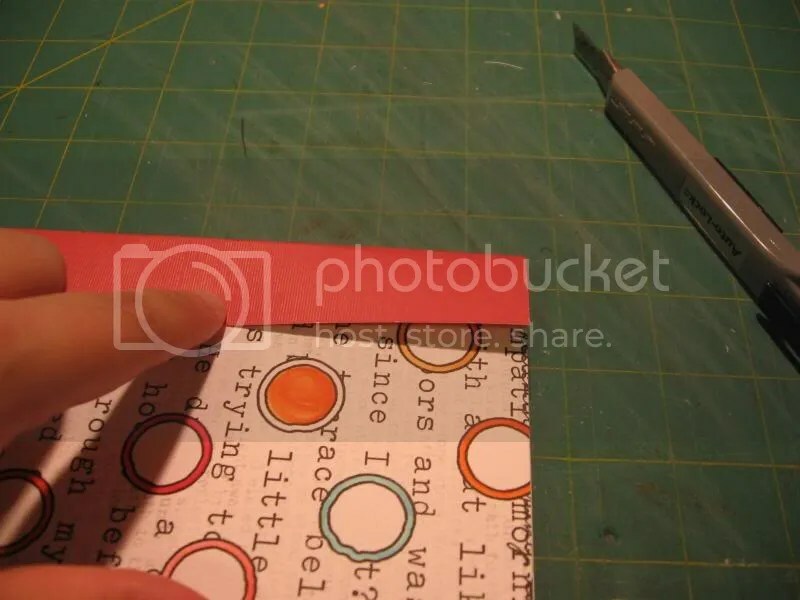 This glue will be what holds your pages together, so feel free to add as much or as little glue as you think is necessary to hold it all together. I think more glue is better! Again, if your pages start to expand just squeeze them back together. 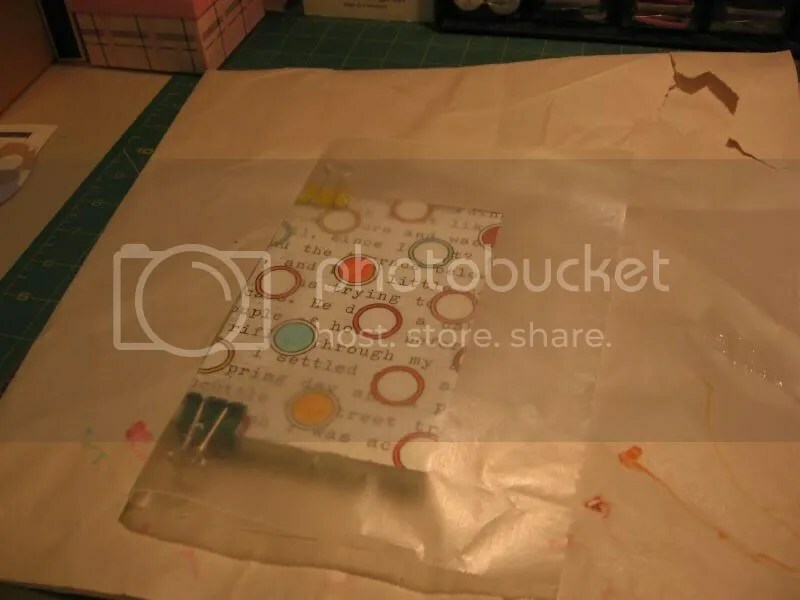 Step 8: Using your sheet of wax paper tuck your notebook inside with the glue side facing toward an open end. I took my photo then remembered to flip my book around so that the wax paper fold was around the ungluey side of my notebook. 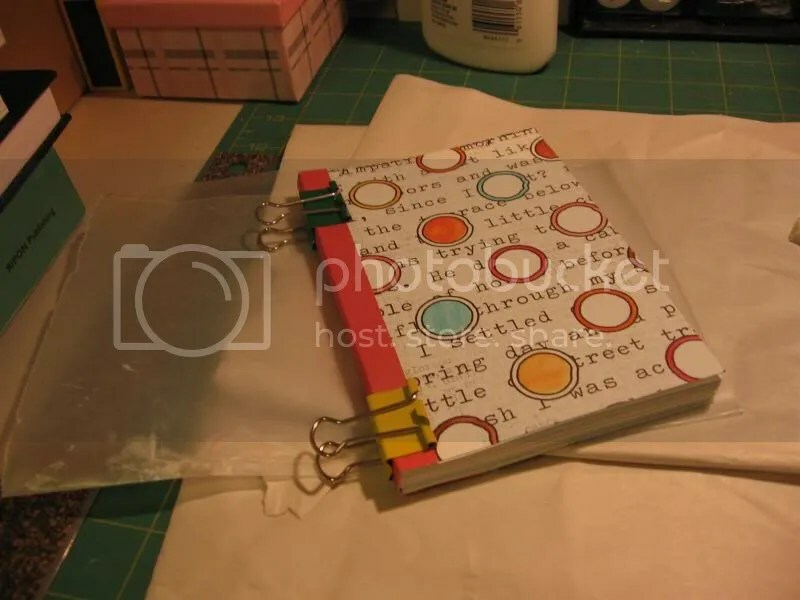 At this point you can also add more binder clips if you are worried about your pages expanding, just be careful that your binder clips don’t become glued to your paper. 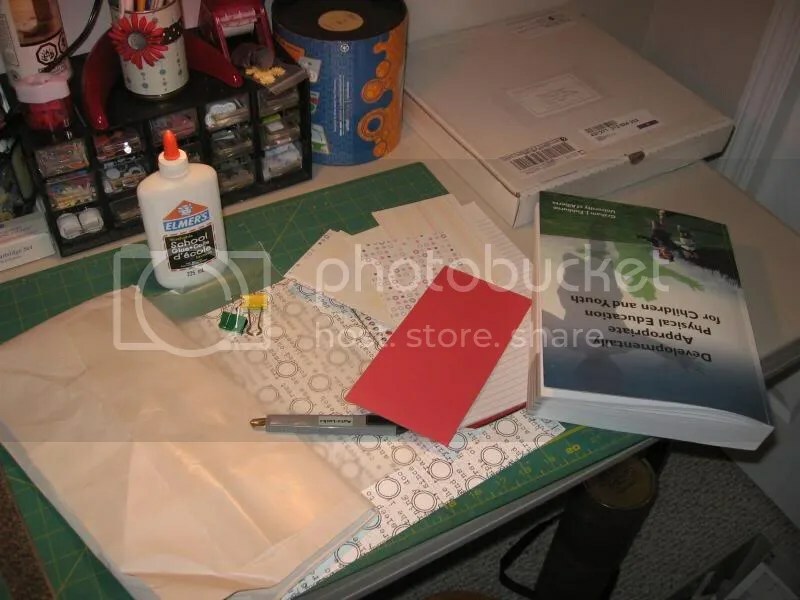 Step 9: Your wax paper notebook sandwich should be lying on your work surface. 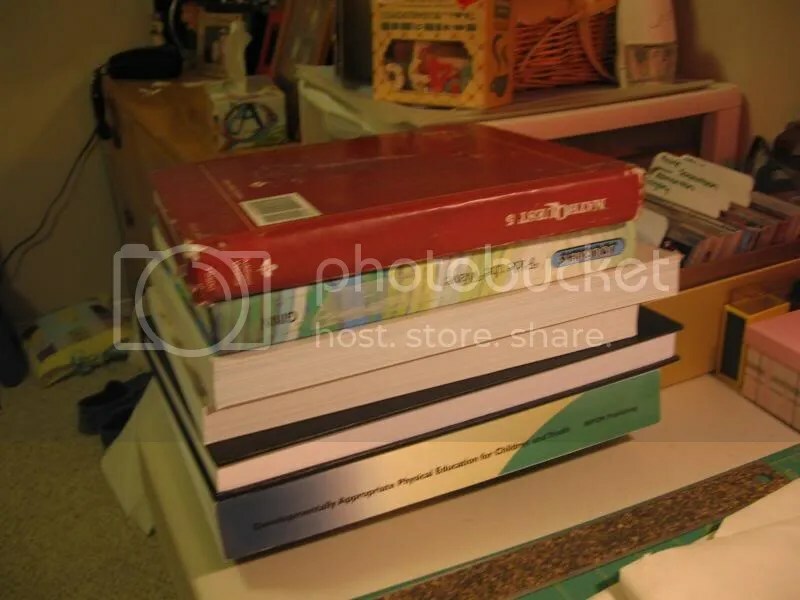 Using a pile of the heaviest books you can find stack them on top of the notebook so help flatten your pagers. I used a lot of books, though you can use less. I let my notebook dry for about ten minutes under the big stack of books before I removed the binder clips from my notebook, though you can leave the binder clips on for the entire process. Your notebook should stay under the stack of books until the glue is dry. This can vary from 15 minutes to an hour depending on how thick your glue was. I let mine dry for close to an hour. 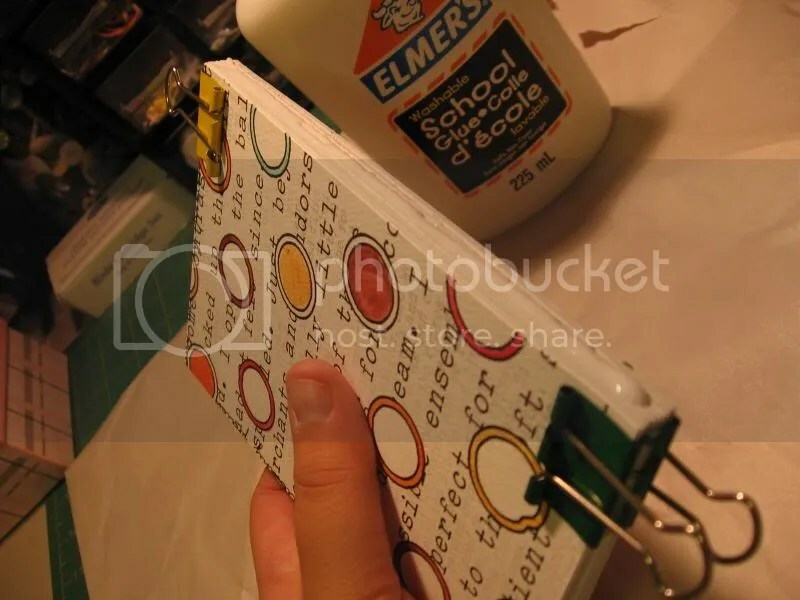 To see if your glue is dry just touch your finger to the spine of your notebook. If it doesn’t seem like you have used enough glue, repeat steps 6 to 9. Step 10: After your glue had dried remove your notebook from the wax paper sandwich and take off your binder clips if you have not already done so. 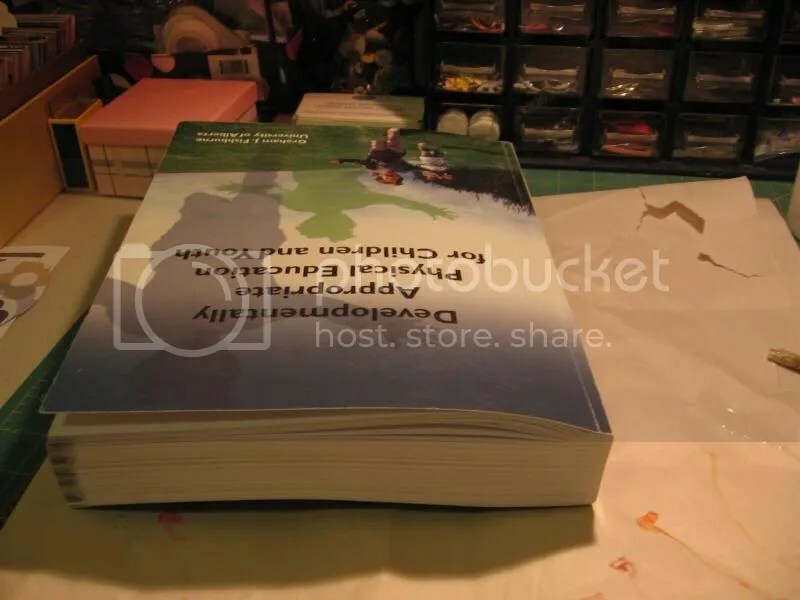 Your book should look something like this at this point. Step 11: Now we’re going to make our spine covering. I decided to use cardstock, but you could use any other medium weight paper for this. Since it’s the spine of your book it needs to be able to bend, so you don’t want anything too stiff. 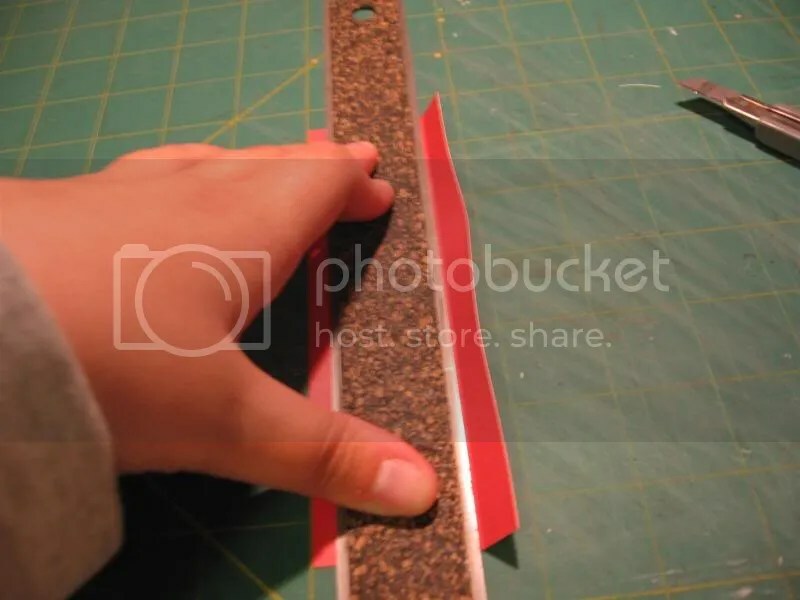 I cut a strip of cardstock 6 inches long by 2 inches wide. 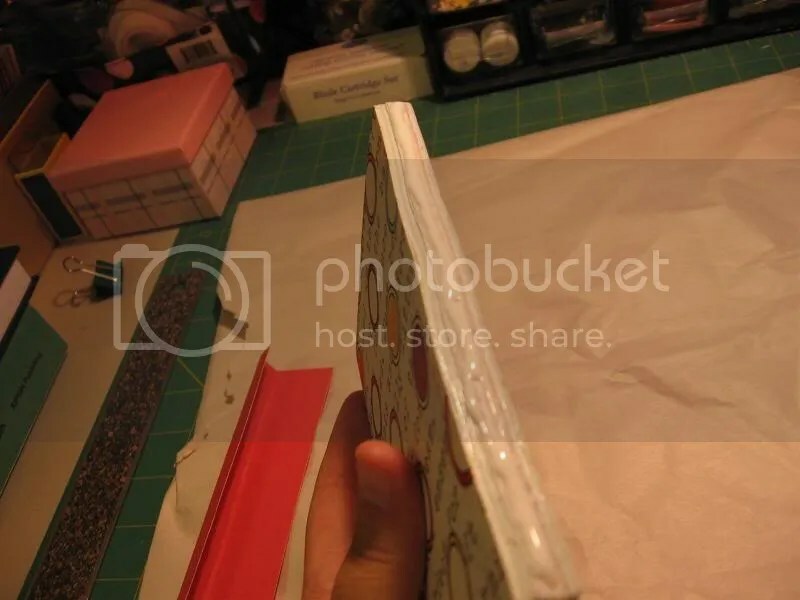 Step 12: I used my ruler to mark where the first fold would be on my spine cover. 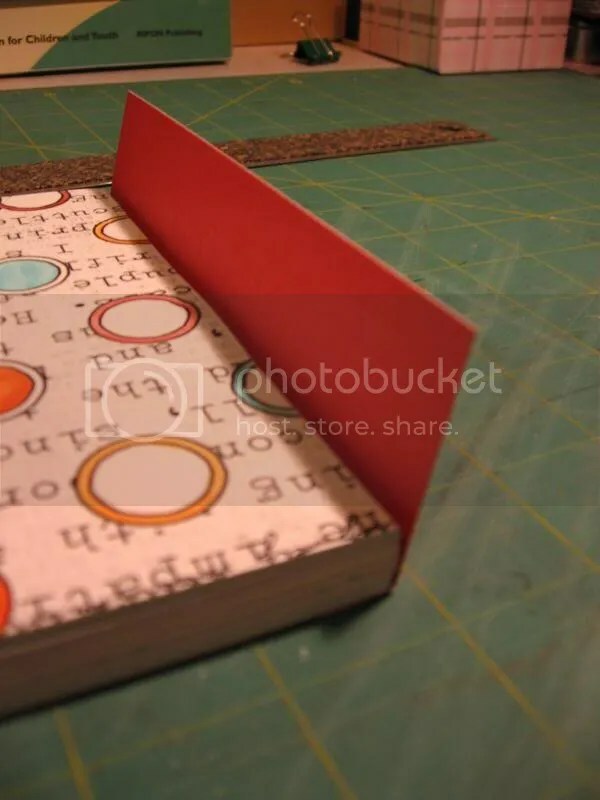 Step 13: Place your spine cover with the fold underneath your notebook, then make the next fold using the thickness of your notebook as your guide. 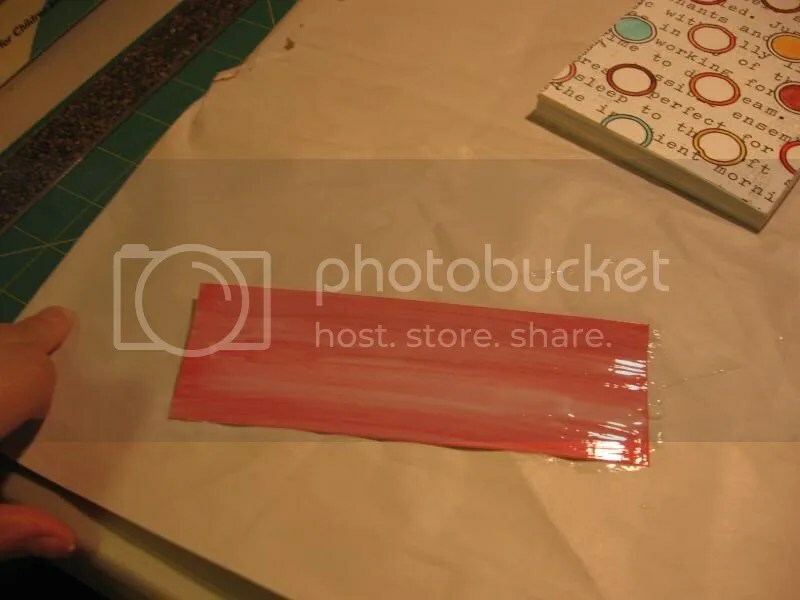 Step 14: Using your paintbrush spread another layer of glue on the spine side of your notebook, as well as all over your cardstock spine cover. Make sure you get the edges of your spine cover well covered because you don’t want these areas to lift. Step 15: Line your spine cover up on the spine of your notebook, and fold over edges. Run your finger up and down the spine to make sure you get a good stick, and smooth over the edges. If any excess glue sneaks out, wipe it up now. 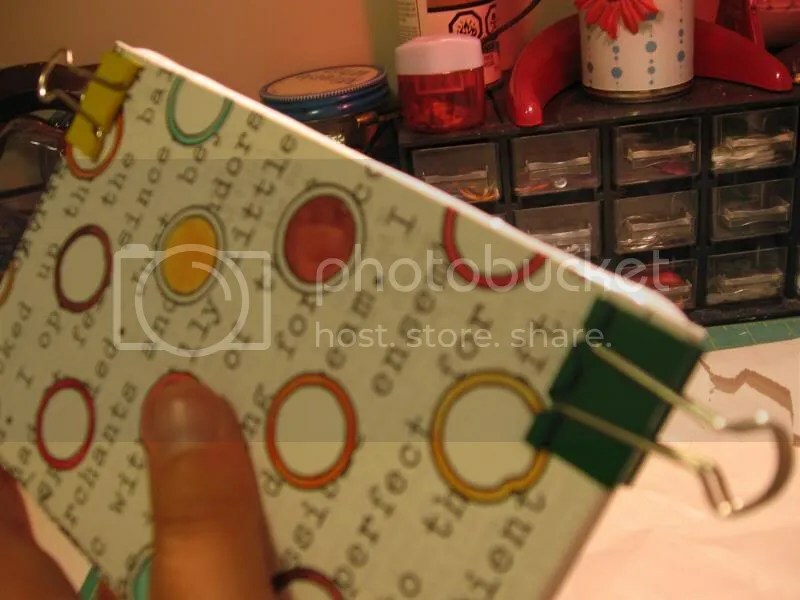 Step 16: Use your binder clips again to squeeze your notebook and spine cover together. This might make more glue out, so once again just wipe it up now. Step 17: Wrap your notebook up in the wax paper sandwich again, and place large stack of books on top. You want to leave this dry for quite awhile, so I decided to leave mine over night. I didn’t remove the binder clips part way through this time though you could if you wanted. Step 18: The next morning remove your stack of books and wax paper, then voila! Your own notebook. It’s not going to be the toughest notebook you’ve ever used, so you need to treat it kindly, but it will hold together not bad for you. 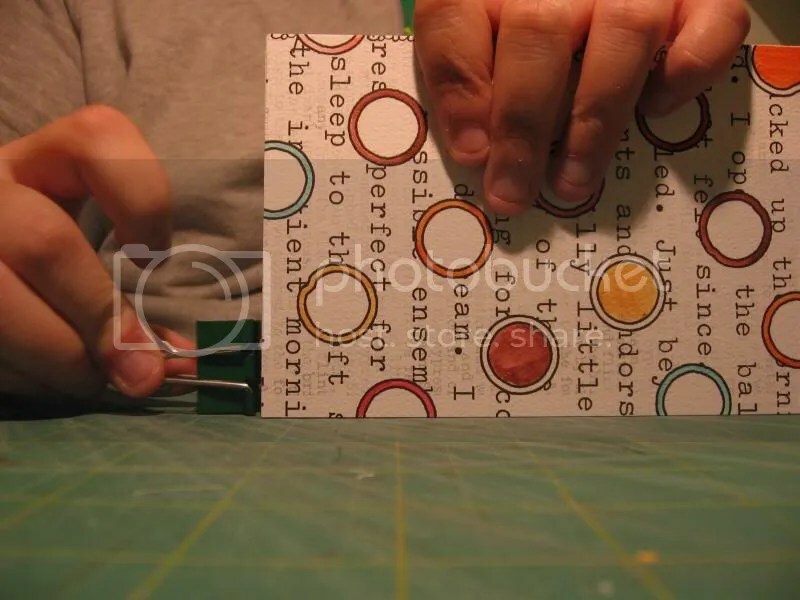 The trick is to use thin paper and lots of glue when first adhering the papers to each other. I’m going to keep my notebook by the computer so I can jot down ideas when inspiration strikes. Check out the Maya Road blog here. Purchase amazing Maya Road product here. This week’s challenge is of a different sort. Are you ready? 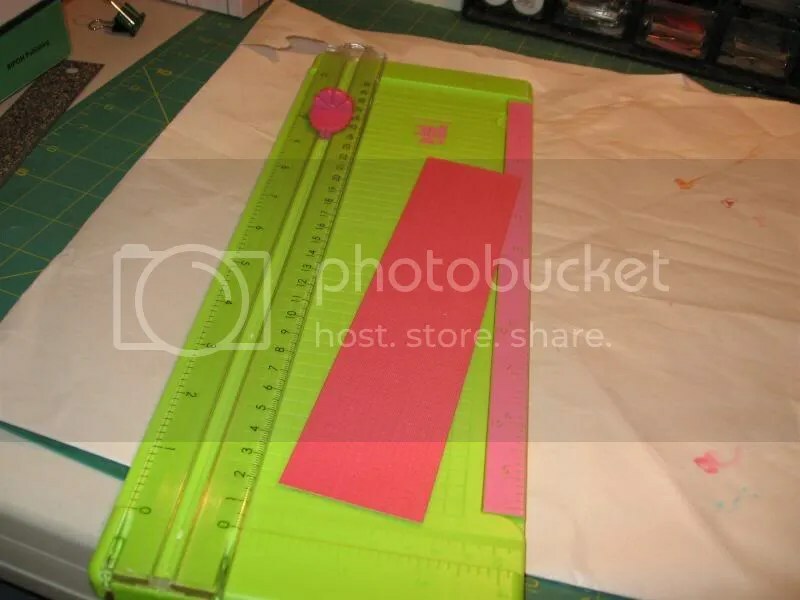 A lot of people I know, including myself, have pretty messy craft/scrapbooking spaces. We all talk about how we’d love to have an area that is clutter free but don’t know where to start. Today I challenge you to start the process by picking out one area of your space and working on getting that small spot ship shape. 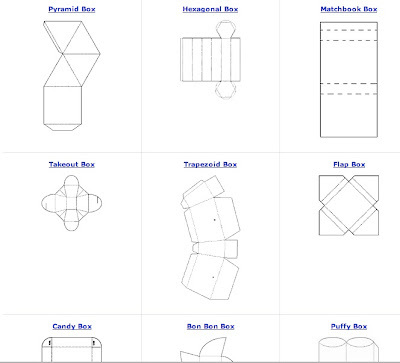 Perhaps it is the area where you store your ribbon, or various paints. Maybe it is your paper stash that needs straightening up. Whatever it is, tackle one small space. Not the whole room. That will lead to feeling overwhelmed and result in giving up in frustration. Just baby steps. One small section. That’s it.